These APIs are dedicated to control directly the Effectors of the robot in a Cartesian space using an inverse kinematics solver. Each Effector can be controlled individually, or in parallel with other. 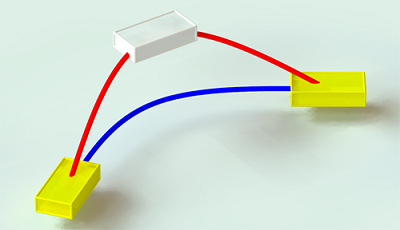 a classical IK solver which uses only the joints of the effector chain to reach a target. a generalized IK solver (also called Whole Body control) which uses all the robot joints to reach a target. There are also some whole Body user friendly function (balance control, safe Cartesian command and so on). The details of these functions are in Whole Body control section. The geometric model of the robot gives the effector positions ( ) relative to an absolute space in function of all the joint positions ( ). The direct cinematic model is the derivative of the above equation with respect to time. where is also called the Jacobian matrix. In many cases, is not invertible directly (matrix not square), in our case we use the Moore-Penrose pseudoinverse to solve mathematically this problem. The classical IK solver due to robot singularity configuration could create huge joint velocity and the robot could lose balance and fall. For this reason, all Cartesian motions should be tested in a simulator before being tried on the robot. Most of the methods are unusable for Pepper. Definitions and calculation rules are available in the ALMath library: libalmath Overview. An Effector is a predefined 3D point in the robot and it’s generally the end of a chain. control the foot to kick in a ball. For further details, see: NAO’s Effectors. When creating a command for a robot, much attention needs to be placed on the space used to define the command, as a mistake in space could lead to disastrous results. 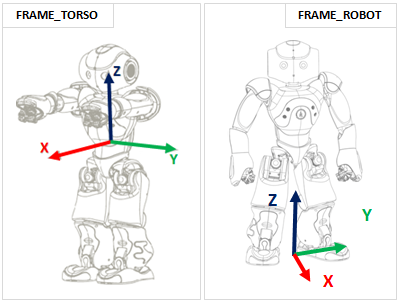 FRAME_TORSO: this is attached to the robot’s torso reference, so moves with the robot as he walks and changes orientation as he leans. This space is useful when you have very local tasks, that make sense in the orientation of the torso frame. 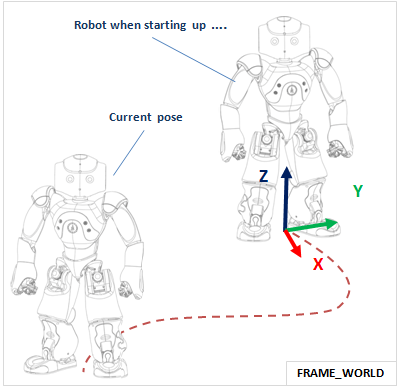 FRAME_ROBOT: this is average of the two feet positions projected around a vertical z axis. This space is useful, because the x axis is always forwards, so provides a natural ego-centric reference. FRAME_WORLD: this is a fixed origin that is never altered. It is left behind when the robot walks, and will be different in z rotation after the robot has turned. This space is useful for calculations which require an external, absolute frame of reference. When executing a task, the space is determined when the task begins, and remains constant throughout the rest of the interpolation. i.e. the interpolation, once defined, will not change as the reference changes due to the legs moving or the torso orientation changing. When controlling the robot’s arms, he does not have enough degrees of freedom to be able to realize a task that has six constraints. These definitions are available in the ALMath library. For further details, see: libalmath API reference. The axis mask is executed in the same space used to define your task. It has the effect of liberating the constraint on each axis which is not part of the mask. Note carefully that a mask in space FRAME_WORLD is likely to be very different to one in space FRAME_TORSO. For the Torso, LLeg and RLeg effectors, the axes which are not part of the mask will have a fixed position. i.e. they will not move while performing the task. For the Head, LArm and RArm effectors, the axes which are not part of the mask are not constrained. i.e. free to move in order to perform the task. SE3 Interpolation is used for all interpolations that are defined in Cartesian Space. It provides a spline-like interpolation which allows for initial speeds and points of passage to be taken into account, ensuring smooth trajectories that respect speed constraints. If the desired motion is unfeasible, the robot can lose balance and fall. All Cartesian motions should be tested in a simulator before being tried on the robot. This example show a simple path composed of two control points, the target and the current position. It uses relative coordinates, so the current position is all zeros. """Example: Use transformInterpolations Method on Arm"""
Use case of transformInterpolations API. This example shows how to do simultaneous trajectories of the Torso and the legs. The non-controlled right leg, will behave as if it received a zero relative command. Move and turn the Left Foot outwards, with an upright intermediate position. """Example: Use transformInterpolations Method on Arm on Foot"""
Use transformInterpolations Method on Foot. print "This example is not allowed on this robot." The goal of this example is to simultaneously control three effectors: the Torso, the Left Arm and the Right Arm. Left Arm motion: blocking method during the last half of the torso motion. """Example: Use transformInterpolations Method on Arm and Torso"""
The goal of this example is to apply 15 degrees rotation around axis y to the Left Arm. In this case, it is difficult to compute the desired target as a position6D, from current position6D of LArm and rotation of 15 degrees around the Y axis. We cannot add 15 degrees to the wy component. In this general case, Transform is much simpler to use. This example uses the setTransforms method to create a rotation.